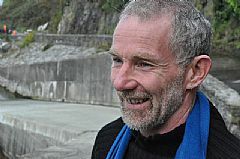 Ian Stephen was born in Stornoway in 1955, and still lives there. His poetry and short stories have been published internationally since 1979. His first poetry collection was Malin Hebrides Minches, a collaboration with the photographer and film maker Sam Maynard, and his next will be Maritime, selected poems with images by Christine Morrison. His debut novel A Book of Death and Fish was a book of the year in the Guardian (Robert Macfarlane) and The Herald.